NOW A NETFLIX ORIGINAL SERIESIn their most daring misadventure, the Baudelaire orphans are adopted by very, very rich people, whose penthouse apartment is located mysteriously close to the place where all their misfortune began. Even though their new home in the city is fancy, an... read full description below. NOW A NETFLIX ORIGINAL SERIESIn their most daring misadventure, the Baudelaire orphans are adopted by very, very rich people, whose penthouse apartment is located mysteriously close to the place where all their misfortune began. Even though their new home in the city is fancy, and the children are clever and charming, I'm sorry to say that still, the unlucky orphans will encounter more disaster and woe. 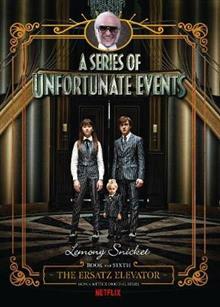 In fact, in this sixth book in A Series of Unfortunate Events, the children will experience a darkened staircase, a red herring, an auction, parsley soda, some friends in a dire situation, a secret passageway, and pinstripe suits. Both literary and irreverent, hilarious and deftly crafted, A Series of Unfortunate Events offers an exquisitely dark comedy in the tradition of Edward Gorey and Roald Dahl. Lemon Snicket's uproariously unhappy books continue to win readers, despite all his warnings.